The Maah Daah Hey Trail Association (MDHTA) is sponsoring the 2019 Trail Challenge to encourage hikers, bikers and horse riders to discover, use and enjoy the Maah Daah Hey Trail. The Trail Challenge is offered in four categories, a 25, 50, 100, and 150 mile trail challenge. Anyone who hikes, bikes or horseback rides 25, 50, 100 or 150 miles on the MDHT or on any of its affiliated trails including the Buffalo Gap, Long X, Wolf, Aspin, Bennett, Cottonwood, and/or Summit) during calendar year 2019, in aggregate or all at once, will be eligible for a patch. More information about the challenge and a challenge log will be available for download at: the Maah Daah Hey Trail Facebook page or from here. We encourage participants in the challenge to post their pictures and their stories to the Facebook page or send them to the MDHTA so they can be posted to the MDHTA website. The Maah Daah Hey Trail is a 144 mile National Recreational Trail in the western North Dakota Badlands. 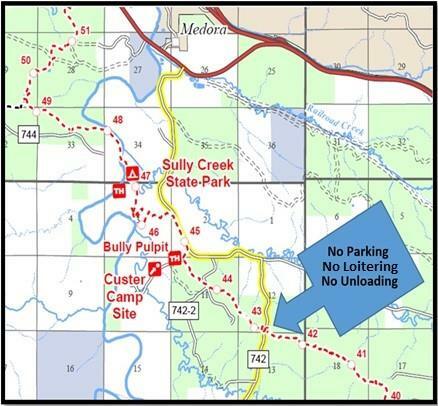 It a non-motorized multi-use trail and goes from the Burning Coal Vein Campgrounds just north of Amidon on the south end ending at the CCC Campground south of the North Unit of the Theodore Roosevelt Park on the north end. The Trail travels through National Grasslands, the South Unit of Theodore Roosevelt National Park, the North Unit of Theodore Roosevelt National Park and Sully Creek State Park, North Dakota State Trust Lands, private land and generally follows the Little Missouri River. 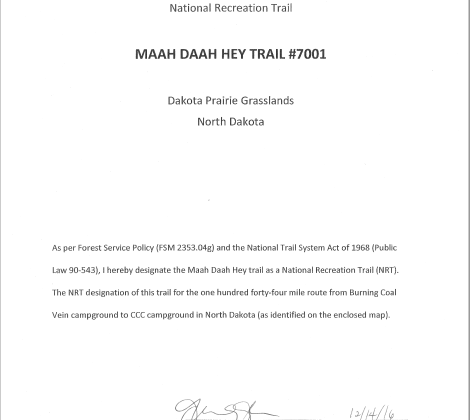 The Maah Daah Hey Trail Association is a non-profit 501(c)(3) organization dedicated to the promoting and maintaining the Maah Daah Hey Trail and telling its story.